Songs of a Sistermom: Motherhood Poems is a soulful and heartfelt look into the symphony of motherhood, through the poetic prism of one woman’s journey. The book celebrates the African-American mother and her experience, and was inspired by the author’s own experiences along with her association with a Washington, DC-based support group, Sistermoms, Inc., for African-American mothers and their families. The book examines four very different movements or phases of motherhood and "sings" about the diversity of feelings that mothers experience everyday. 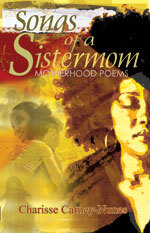 ›	Motherhood Poems for Every Mom. Mommy Too Magazine, November 2005. Read here.